The moment was surreal. Aaron Rodgers had a wide open Jermichael Finley. And when I say wide open, I’m talking as open as my Cadillac windows on a summer day (my air conditioner is broken so the windows are ALWAYS open); I’m talking as open as the Taco Bell drive thru at midnight. Finley was open. But Finley seemed to decelerate and Rodgers threw an errant pass, the ball hit the ground. At that moment I knew. I knew the Packers were going to lose. Cue the pity music. I’m sure if someone was videotaping me (It’s not like anyone would, but hypothetically speaking) I looked like one of those abandoned or abused animals in those “donate to our cause” commercials– you know, the ones that make you feel really bad about sitting on your comfy couch and enjoying those chocolate chip cookies. My eyes were glossy: glossy, but no tears. I thought about the season, all the good times: the rise of the Discount Double Check move, Rodgers’ historic season, and Jordy Nelson’s emergence. Those memories didn’t help me though; they only made me feel worse. I felt like a hungry teenage male who simply wanted Chick-Fil-A, drove all the way to Chick-Fil-A, and then realized it was Sunday. I was drowning in a sea of sadness. Although the Packers are out of the playoffs, the playoffs (and all sports in general) continue and so does my quest to identify and predict the best games of the week. Last week was filled with sadness, but now I can see the light at the end of the tunnel. This time I didn’t have a Muscle Milk, and my intuition is feeling strong. Ah, such an interesting matchup. My heart wants the Ravens to win. I mean who wouldn’t want the Ravens to win after what Belichick and Brady did to Tebow last week. And who can stand the ranting maniac that is Skip Bayless? After debating Terrell Suggs on his show, I’m sure Suggs has Skip’s annoying voice saying “the Ravens defense is too old” on a loop playing in the back of his head. Every play, he’ll probably see a little visual picture of Skip and will proceed to pop the next guy who will get in his way. 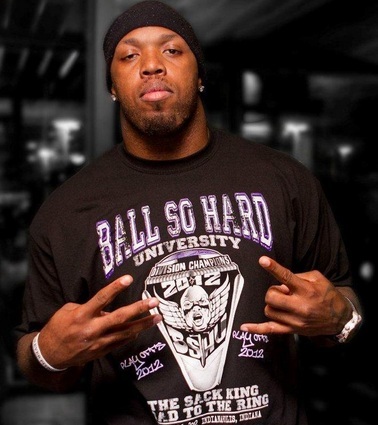 So, I see Terrell Suggs having a big day. After that, I don’t have much faith in the Ravens. I don’t understand how anyone could. Yesterday, my colleague and I placed a ten dollar bet on this game. I had the Patriots. I couldn’t believe it. So, I asked him all the usual questions when referring to bets. And that’s the exact reason, why I’m scared about this game. I’m almost 99% sure the Patriots will beat the Ravens. The Ravens are 4-4 on the road, Brady is coming of one of the best performances by a quarterback in the playoffs, and the killer Tight end tandem of Hernandez and Gronk is the coolest thing the NFL has seen since the forward pass. But something tells me that the Ravens will put up a good fight and might event pull off the upset. In the end, though, Brady and Belichick will be returning to the Super Bowl, leaving Terrell Suggs with countless nightmares of Skip Bayless and the Patriots offense. Man, was I wrong about the 49ers. Their stifling defense was a pure joy to watch. I think after watching the whole game, I saw two missed tackles, which in today’s NFL game is like saying I saw Bill Belichick smiling or DeSean Jackson not whining—it’s unheard of. As for the Giants, see the above intro to get my reactions on the game. The two quarterbacks in last week’s games both proved their respective doubters wrong. Now, for this game, it will be how they handle the success they experienced last week. And for this category, I like Eli, simply because he has had success (I’m sorry to say this, but I don’t think Alex Smith has ever experienced success in the NFL. Ever). What stuck out to me about Manning’s game last week was his ability to convert on third and long situations, which, when playing the 49ers defense, will occur frequently. If Manning can replicate last week’s success in those situations the Giants will be able to gut out a win, and set up the classic everyone remembers from four years ago Giants vs. Patriots. Kansas is coming off a huge win against Baylor with great performances from Thomas Robinson and Tyshawn Taylor. It seems like the win woke up the sleeping giant that is all KU fans. There was a nice serenity to not having to hear KU fans claim their team is “the greatest ever even in a down year.” Please, Kansas fans give it a rest; let’s wait until March to start claiming Kansas is “the best team ever.” Unfortunately, I don’t think these KU fans will quiet down anytime soon, as Kansas will beat a struggling Texas team that recently lost to Kansas State earlier in the week. Although, I said, I wasn’t going to pick against the home team, for this game, I see Kansas winning. Indiana State at (18) Creighton, Sat. Jan 21, 2:00 pm– The Missouri Valley should be given some serious attention with many quality teams. Doug McDermott is a legitimate player of the year candidate for Creighton and is fun to watch. (1) Syracuse at Cincinnati, Mon. Jan 23, 6:00 pm– Since the lost and brawl to Xavier, Cincinnati has gone 7-1. This can be a serious threat to Syracuse’s potential perfect season. (13) Indiana at Wisconsin, Thurs. Jan 26, 8:00 pm– If you’re a fan of slow, grind- it- out- games, Wisconsin is your team of choice. Indiana has beaten Kentucky and Ohio State, but Wisconisn will be tough to beat at the Kohl Center. Indiana at LA Lakers, Sun. Jan 22, 8:30 pm- The young Indiana Pacers have suprised NBA experts while the struggling Lakers have been riding on the wearisome shoulders of Kobe Bryant. This can be a big statement game for either team. LA Clippers at LA Lakers, Wed. Jan 25, 9:30 pm-Battle for LA, part II. Blase Capelli is 4-5 for his predictions. He hopes to break .500 after this week. This entry was posted in Basketball, Football, Home, Midwest, National, Uncategorized and tagged Blase Capelli, NFL, Playoffs, Ravens, Terrell Suggs, What to watch.